Begin by speaking to the Dwarven Boatman in the Keldagrim Mine. Firstly, enter the cave east of Rellekka, past the statues and into the Keldagrim Mine. 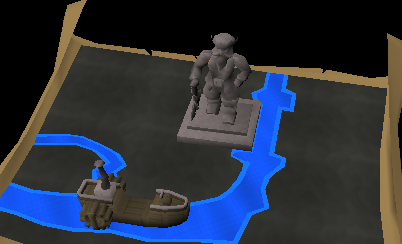 Speak to the Dwarven Boatman and ask him if he will take you to the city. He will tell you yes, and you'll have the option of viewing the movie sequence in either High or Low Detail. Just before you enter the city you'll hit the statue of the Dwarven King and you will be 'arrested' by Veldaban. He will ask you to help repair the statue; tell him that you will try and he will tell you of the great Dwarven sculptor named Blasidar. Blasidar is located north of the bar in East Keldagrim. Ask him if he will help you make a new statue and he will eventually agree... his model Riki just needs to have King Alvis' Battle Axe, his Clothes, and some Exquisite Boots. Now find Santiri in the northwest corner of Keldagrim and tell him that you're looking for a "particular axe." Then tell him that you need it to repair the destroyed statue and he will give you an antique Dwarven Axe that seems to be in rough shape. Take the axe, along with a Redberry Pie to Thurgo located south of Port Sarim (from the Knight's Sword Quest). Ask him about the axe, and he may remind you about his love for Redberry Pie. Speak to him again and then ask him to fix it and he will repair it with the Iron Bar. 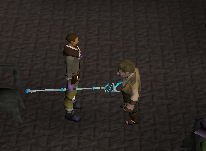 Choose to go back to Keldagrim now, and once you're back you can use 3 Sapphires with the axe to finish it. Head southwest of the bank and speak to Saro, the owner of the Armor shop. Ask him about some particular boots that are fit for a king. He says that he has just sold a pair to Dromund who lives in the house just north of the bank. Talk to Dromund about the boots and he refuses to either give or sell them to you. Take the Left Boot from the table against the south wall when he has his back turned to you. Otherwise, he'll catch you! His cat seems to be guarding the Right Boot, so go outside and stand right outside of the window behind the house. Cast Telekinetic Grab to get the Right Boot, and now you'll have a pair of Exquisite Boots! Now speak to Vermundi who is in the south end of the marketplace in East Keldagrim and ask her about making the King's Clothes. She can, but first she needs a picture of them. Talk to the Librarian in the house in the northeast corner of west Keldagrim and he will tell you to search the library for a book about Dwarven Clothes. Search the bookcase in the northwest corner with a ladder in front of it to find the book. If you weigh too much, you will be unable to climb it, so be sure to put anything heavy in the bank! Take the book back to Vermundi who now needs 1 Coal and 1 set of Logs to get the clothing machine running. Use them on the Spinning Machine and then light them with your Tinderbox. Now pay her 200gp for the Exquisite Clothes. Once you have the Battle Axe, Boots and Clothes, take the items to Riki and then speak to Blasidar. He needs a decision from the Mining Companies to sculpt a head for the statue now. He says that you must first prove that you are worthy, so ask him what tasks he has for you. He will tell you to get a number of ores and bring them back within a certain amount of time. The best way to do this is to teleport to Edgeville (using either an amulet of glory or lodestone), use the 25 agility shortcut to the Grand Exchange, buying the ores/bars on the Grand Exchange, then using the Keldagrim trapdoor in the northwest area of the Grand Exchange to get back. You can accept or decline jobs if you don't have the ores, but you can only have 1 job at a time. You should only focus on completing jobs for 1 company, as you will need to complete around 7-8 jobs before you can talk to the Director. When the Secretary thinks you're worthy, you'll need to get another task from the Director. He will ask for Bars instead of Ores, and after you've completed all of the tasks you'll be accepted into the company and asked to represent them at the meeting. Now talk to Veldaban and he will take you to the meeting. Or, you can skip it and just finish the quest (the meeting isn't very exciting). Congratulations, quest complete! Meeting Notes 2,500 Mining experience 2,500 Crafting experience 2,500 Smithing experience 1,500 Magic experience 1,500 Thieving experience 1,500 Firemaking experience The ability to work for companies and get cash. The ability to use the Cart System under White Wolf Mountain. [^] Speak to Dwarven Boatman. [^] Use 3 Sapphires on the Axe. [^] Take the Left Boot. [^] Cast Telekinetic Grab on Right Boot from the window nearby it. [^] Search a bookcase in upper floor. [^] Take the book to Vermundi. [^] Use Coal, Logs and Tinderbox with the Spinning Machine. [^] Buy the Exquisite Clothes from Vermundi for 200gp. [^] Take the items to Riki. [^] Speak to one of the Secretaries. [^] Get the items that Secretary/Director wants. 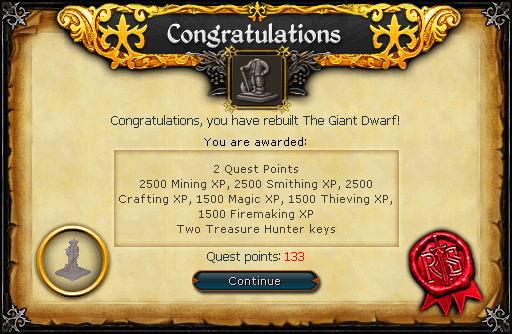 This quest is the first quest in a series of quests known as 'Rise of the Red Axe'. The Red Axe is one of eight mining companies belonging to the Consortium which rules over Keldagrim. The Red Axe company is led by Hreidmar, who is plotting to take over Keldagrim with the help of the chaos Dwarves.